Some exercises are better performed with lighter weights. Building well developed and massive muscles will at some point or another require you to increase the loads you are lifting. Although lifting heavy is not always hazardous for your body, some exercises are better performed with lighter weights. That’s why you need to choose your exercises and loads wisely. If you start doing wrong moves with heavier loads, you might end up injured. 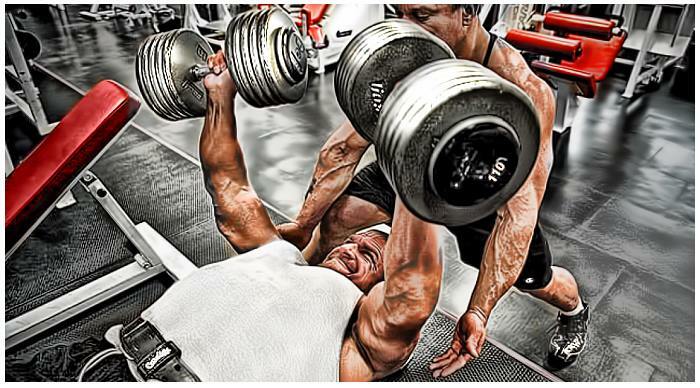 Here is a list of six exercises which should never be performed with heaviest loads. There are many people out there who try transforming their dumbbell fly into a quasi-press, or just swing their dumbbells using the momentum in order to handle the weights, when they should be focused on muscle work. And there are still others who try to squeeze out a prolonged ranged of motion. Overloading your dumbbell flies, and taking them to extreme range of motion will not only fail to deliver the desired results, but may also leave you with an injury. When you try to cheat on form when performing this movement, you only cheat yourself off the results that can be made if you do it properly. It would be much better to perform this exercise with lighter weights, and keep your focus on executing them with proper form and technique. In addition to the fact that this exercise is totally useless when it comes to developing your traps, the other problem of this move is that it can be really damaging for your shoulders. When it comes to this exercise, most people agree that it should be eliminated from any training protocol. However, if you’ve set your mind on doing it, then at least don’t add any weights. Stability ball press is one of the exercises that should be avoided when you are doing strength training. The truth is that this movement was primarily intended for people who are undergoing a physical therapy. Doing presses on an unstable surface can be very damaging for your body, and it does not provide the wanted results. If you want to do presses, it would be much better to perform them on a stabile surface. Most of the people who stick to the old-school routine would tell you that behind the neck presses are very effective for total shoulder activation. However, although this exercise can be very effective, it also involves a high risk factor for injury. This exercise creates your shoulders in a very vulnerable position, because the rotator cuff has problem to handle the mechanics of the movement. Even a slight injury of the rotator cuff will make you unable to handle heavier loads, distancing you from the gym for good. Substitute this exercise with dumbbell presses. However, if you’re set to do this exercise notwithstanding the risk, at least don’t go heavy. Kipping pull-ups are one of the most overvalued exercises there is. They are recommendable only for people who are involved with CrossFit training. It requires a great deal of shoulder strength and stability – which is something that not all people have. We would recommend eliminating this exercise from your repertoire. However, if would still like to try it, adding extra weight will make it worst. Take our advice and go light when doing this variation of the pull up.